Wacky Racers: Rick Pe? ... Rick P? ... Er ... Oops! Home Nonsense Funny Articles Wacky Racers: Rick Pe? … Rick P? … Er … Oops! If you are going to be 21 by the time the next election rolls around or if your ancestors fought for American Independence in the 16th Century revolution or if you dislike barking carnival acts run by dogs, Hercules and Demagoguery, then Rick Perry may be the candidate for you. To win the Republican nomination, to be elected President and …. Geez! … What was the other thing? 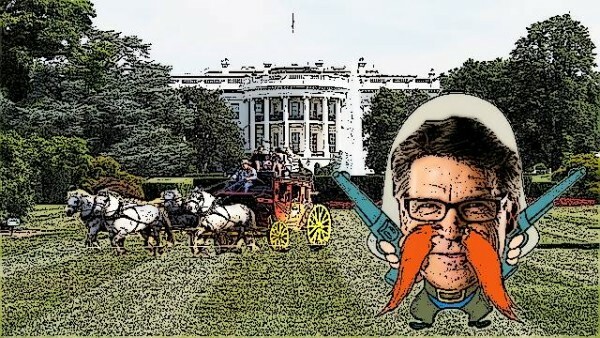 Many speculate that Perry has the bearing of a man twice as intelligent as when he last ran for President although others maintain that his IQ score would remain unchanged regardless of what you multiplied it by. Previously played Chandler in Friends. Famous For inventing Perry Perry Chicken. Brother to Luke Perry and Chuck Berry. Believes a good strong stance is essential … if you’re wobbling about all over the place you can’t hit anything. Denies rumors about having a small periwinkle. Perry has been dogged by environmental groups for years, groups that claim a trouser pocket is not moist enough for a small crustacean to survive or … shouldn’t be. Upon taking office as Governor of Texas in 2000 there is evidence that staff covered up Perry’s attempts to order more stars for the state’s night sky.